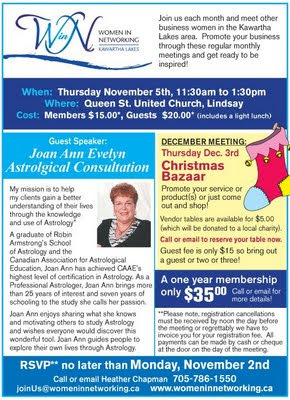 Next Thursday, Nov.5th is our next WiN meeting and our guest speaker is Joan Ann Evelyn of Astrological Consultations (full details below). Our 5min spotlight speaker will be Sue Sutcliffe of OrGano Gold Healthy Coffee. A small door prize would be greatly appreciated and don't forget to bring your empty wine bottles for JobsRUs. Please let me know as soon as possible if you plan to attend.